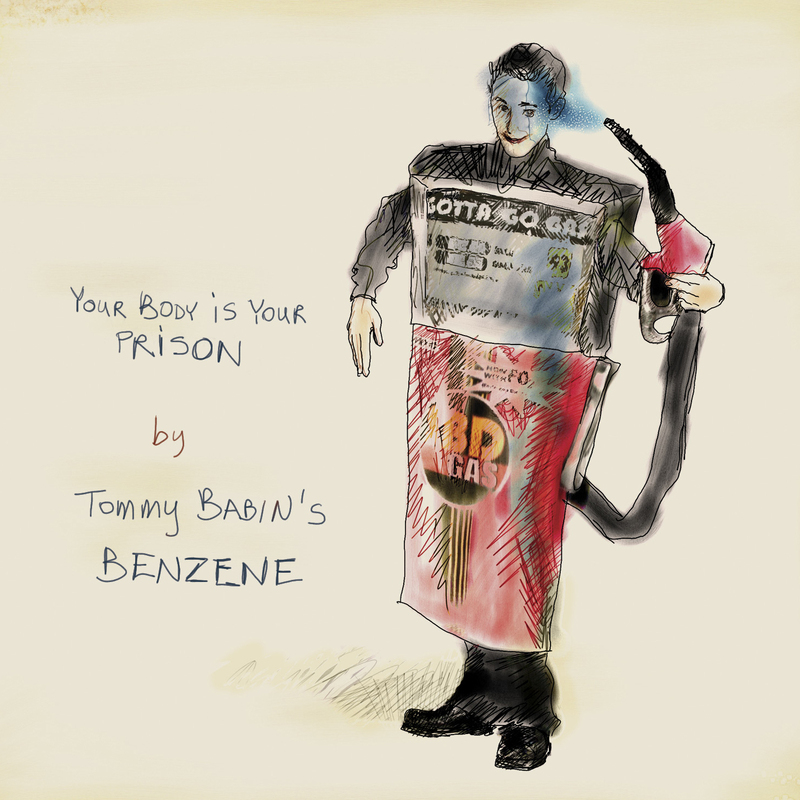 Your Body Is Your Prison by Tommy Babins Benzene brings the listener on a ride between full tilt free improv, hypnotic space-out rock and subtle balladry, all connected and interweaved as the band takes the helm to improvise an uncharted path between a series of wildly varying themes. The whole album was recorded live in the studio as one piece, as one take, capturing the excitement of the moment as the musicians perform with a never the same way twice ethos , and is meant to be listened to as a complete work in a single sitting . Acclaimed baritone saxophonist Chad Makela, guitarist Chad MacQuarrie (Dark Blue World, Copilots), bassist Babin and drummer Skye Brooks (Fond of Tigers, Inhabitants) are captured performing this music in the truest sense of the word with a level of communication, abandon, and freedom of mind that are rare in studio recordings. Your Body Is Your Prison is Vancouver-based bassist and composer Tommy Babins first album featuring solely his own compositions, although his work as a composer and arranger can be heard on albums by such diverse artists and ensembles as Dark Blue World, Sky Beneath My Feet, Jeszcze Raz, Jorane, and FACT. As a bassist Tommy can be heard on scores of albums and has performed worldwide with a wide array of artists such as Gordon Grdina, Ramachandra Borcar, Jorane, Paul Plimley, Les Projectionnistes, Hamid Drake, Mats Gustaffson, The NOW Orchestra, Kudsi Egerner, Thomas Hellman and Joel Miller. "A crafty exercise in maddening juxtaposition, Your Body is Your Prison pits full-bore free-improv against stratospheric out-rock." - Exclaim!